This is the pic the NYT offers in its latest piece on the Britain-Iraq standoff. 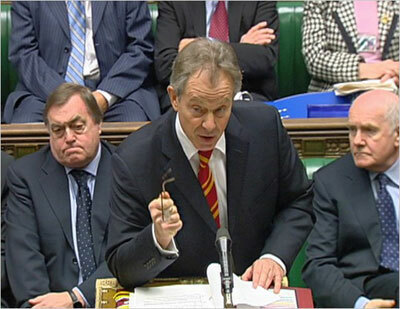 Tony Blair is said to be lashing out at Tehran. Besides an old and worn looking PM, the hopeless, downcast faces behind (not to mention the headless trio beyond that) seem to well capture the near-total exhaustion of Blair's moral and political authority. trying to make the most of a manufactured "crisis", only nobody is buying. Not even the U.N. They're going to have to try something else to gin up an excuse for war. It's almost April guys, and Tehran remains unbombed, you're behind schedule. There's nothing like the weight of the world to trace macabre lines of the not-so slow march to death. Remember what he looked like 10 years ago? He looks like he's been on a bender. It seems the last two or three years have been particularly hard for him. The UK press is openly mocking him with the "Bush's poodle" meme, and in stiffer upper lip fashion, he just has to sit there and take it. ...as if they, the British ~ had some right to occupy IRAQ, quarantine the Shatt Al Arab waterway, and engage their Royal Navy forces to halt, board & 'inspect' neutral-flagged commercial shipping. The irony of the British political position escapes them, as they (and the western media) remained obsessed with the GPS position of Iranian patrol boats when the British Marines were arrested. The dude on the right looks like he is prepared to intervene if the dude on the left decides to act improperly. Definitely bad for Blair's ego but I suspect its his conscience that's causing a greater spot of bother. A *devote* catholic he said on the Michael Parkinson, ITV program (03.3.06) the verdict on his decision regarding Iraq would come from, " other people and if you believe in God, God as well ". Well other people namely *his* at the UK's Dept for International Dev and the chief scientific advisor for DOD believe the figure of 655,000 deaths estimated in The Lancet study to be credible. Will he continue with "the overriding message is that there are no accurate or reliable figures of deaths in Iraq"
Will his God have him answer to, " You shall not murder" or " You shall not bear false witness " or to both commandments ? This was just a stunt - created by the same folks that brought us the lies that lead to the war crimes and crimes against humanity in Iraq. They needed to create an "event" that would make it impossible to have a dialog with Iran right now. The rest of the world is calling for talks - now they can pretend that this is impossible. If the intent is to invade Iran - then creating a fake "crisis" to provide and excuse not to talk was necessary to push the plan to fruitation because their is no "coalition of the willing." The spin from the msm (Newsweek, WSJ, WP) in this country, today (Diane Rhem show-NPR) is that the Global Positioning system "proves" the Iranians were in Iraqi waters. The US and Britian will pin the whole thing on the Iranians and will benefit, economically, along with Israel, from the whole sorry business! Blair has hung on way too long; he's almost pitiful. When they his face directly from the front, he looks very bald... not as bald as John Reid (on his right), but getting there. Here, he's doing his "forceful" routine, as if the vestiges of the British empire still have some power or relevance. I'm sure the Iranians are quaking in their boots. Tina, supposedly Russian intelligence reports are saying that an attack on Iran is planned for April 6 (next Friday at around dawn our time). I guess the extra "surge" soldiers are in place, as are the aircraft carriers inside and outside the Gulf. I hope they're wrong. I don't know who benefits the most economically, but I know that whenever there's an incident like this, oil prices go way up. The headless backbenchers....interesting since in the British parliamentarian system it is this more shadowy figures that wield enormous power inside that system. The fact that they sit with hands or arms cross behind the PM means that they are not buying it. Iran is not Argentina, and a the current and perhaps future war(s) in the region, will be nothing like the Falklands, a war that by the way, Britain came very close to loosing. Agreed that Blair is "doing his 'forceful' routine" --- but I don't think that wiggling his spectacles at the enemy is gonna scare them. I am not so sure that this is a "manufactured crisis". This is big trouble for UK. It raises too many questions, like why the flug is UK in Iraq? In the photo, Blair's two allies sure wish to hell that they had reined him in five years ago when he started dancing as Bush's lap dog. Those two are a picture of a No-Win Situation. It's what US leaders are going to look like in about one year. Lost in a Quagmire. This crisis will benefit Israel financially?? Like, how? If the Iranians are the victim here, they sure are playing along with the bad publicity, reprising 1979 but with updated video technology. And as someone said, Blair needs this like a hole in the head. ummabdulla, both are engaged in a strange and dangerous dance, the latest AP dispatch suggests Iran noted the past Israeli bombing waltz in Iraq, remembers Scott Ritter's disclosure of the UN clandestinely assisting Saddam in targeting them military in their last defensive war in addition to whatever information the Russians may have shared with them. AP from Vienna, "reports Iran in a confidential letter posted Friday on an internal Web site of the U.N. nuclear monitor, said its fear of attack from the U.S. and Israel prompted its to withhold information from the agency. In the letter, Iran said the U.N.'s International Atomic Energy Agency had repeatedly allowed confidential information crucial to the country's security to be leaked." Propaganda or prudent thinking ? I heard about that Russian intelligence report; I also heard it was very suspect.....I dearly hope so. Things are pretty bad when you're praying that Russia has bad intelligence. I've heard that the hot film of the moment, "300" is chuck full of kind of a weird anti-Iranian sentiment in which the viewers are encouraged to identify the Spartans as Americans (and root for them accordingly)and the ancient Persians as an Islamic horde (a gay Islamic horde. O-kayyy). Sounds very bizarre to me, and I don't intend to see the film, but if it is so, then it probably isn't coincidence. Remember Rambo and James Bond in Afghanistan in the 1980s, helping out the Taliba--whoops---noble anti-communist mujaihadeen? Didn't think so. The King of the Spartans up there in the photo has got some serious bags under his eyes. I think he should get some rest and not go to war. The world would appreciate it, and he would feel better in the morning. Those power benders leave a hell of hangover, man, just easier to not bother.